When my Influenster Cosmo VoxBox arrived I was happy to see that they included a razor. My last razor had been serving me faithfully only to have its refill cartridges discontinued. I knew I was going to have to either hunt down refills for it Online or... be brave and try something else. So thank-you, Gillette! for giving me a new razor to try! 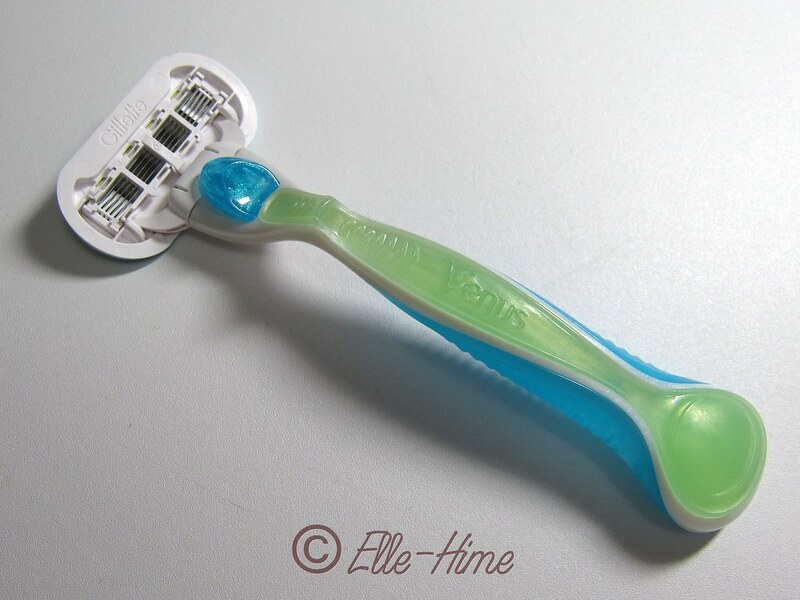 In fact, I have two razors to test. 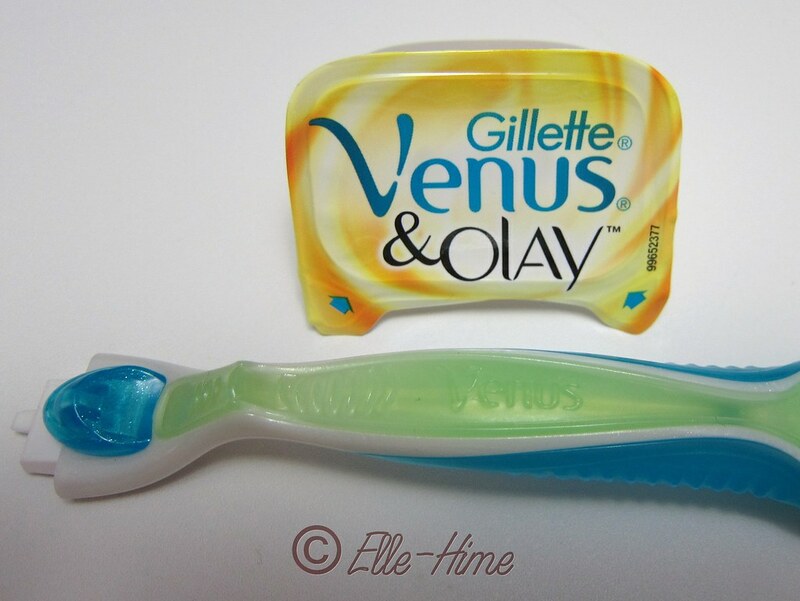 A new Venus & Olay blade cartridge was included with the Venus Embrace blade and handle. So, what did I think of these products? First off, the handle. As you can see in the first image it works very simply - a nice grippy stick with a glittery plastic button that you push forward to pop an old blade off. Then you can put any new Venus blade on because they are all interchangeable! As for the overall comfort and ease of use, it's good. The button stays well out of the way of my hand while using it and the entire handle has a jelly grip. I've seen a couple other colors this razor comes in, where the jelly grips are purple, blue or pink. Being the girly-girl that I am I would have chosen one of those colorways instead of green and blue, but that's a small thing. Razor looks are probably the least important part of shaving, but I love the idea that if you're going to shave with Gillette you can track down whatever handle you like best, and then put your desired blade on that handle. The Venus Embrace cartridges are 5-bladed and surrounded by moisturizing strips that produce their own sort of shave gel in the shower. It's actually dubbed "Ribbon of Moisture" by the company. As soon as the blue ribbon gets wet it starts leaving a slickness on anything it touches and has a stringy consistency. If you don't rinse your razor off after use this will hold onto any bits of hair or fuzz that land in it. I found that this razor gives a very nice shave. The 5 blades make for a close shave while protecting your skin from nicks. But I'm not loving the Ribbon of Moisture feature. It adds a lot of bulk around the blades, and apparently I'm the type of person that would rather have to deal with lathering up before shaving. Because the moisturizing gel doesn't show up on skin I also had to be extra thorough about rinsing. When I went to touch up a few spots out of the shower the wet moisture strips left stringies of goo on my skin. I dry shave with a wet razor, so this doesn't work for me. On to the head from Olay. If I thought the Embrace cartridge was bulky this one seems absolutely massive compared to anything else I've used previously! This is another 5-bladed option, and rather than just a ribbon it has what I would dub "Pads of Moisture", haha. These are on flexible plastic wings that angle down towards your skin, and you press the razor's head down to get the blades against your skin. 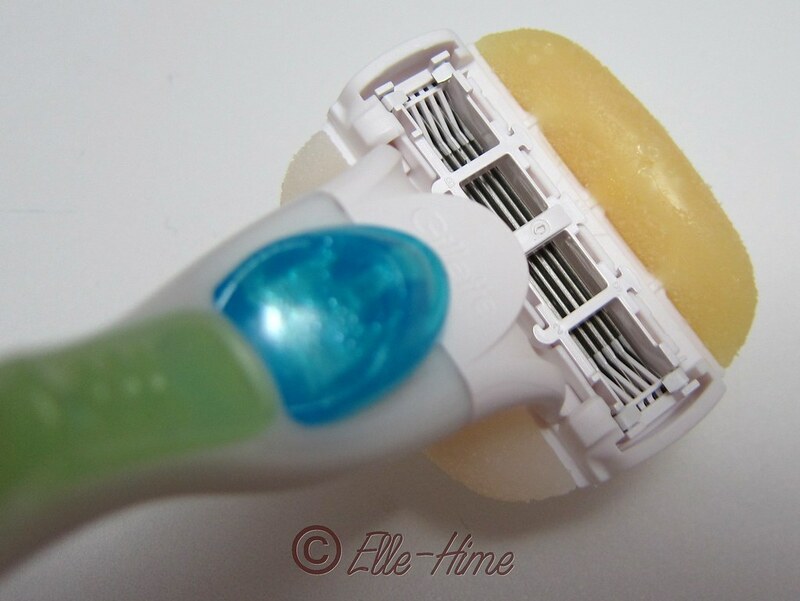 This isn't noticeable while shaving, and it's nice that they designed it in such a way that those moisturizing pads should stay against your skin as they are being used up! I like the above photo because it shows how open the blades are from the top side. The Embrace cartridge is the same way. This makes it super easy to rinse the razor blades clean! The Venus & Olay cartridge produces a light lather as you use it which has a faint scent. Once again this falls into the "not good for dry shaving" boat, but the 5 blades do give a very nice shave in the shower. Another thing to note about both of these blades is that they need to find a home in your shower where the blades won't rest against anything else. I've ended up with little chunks of dried gel on whatever happened to be within reach of my Venus razor! I will use both of these razor cartridges until they are dulled and actually need replacing, because while I'm not a fan of the "no shave gel needed" feature it isn't horrible. It does make for a smooth shave and I do believe they left my legs a little softer, so they are fine for use in the shower. They just aren't cutting it for dry shaving touch-ups. Gillette included a $2 off refill coupon with this Influenster trial kit so I've used that to pick up some of their basic blades. Once I get around to trying them I'll post my findings on the blog! I expect that they will be more to my liking. These razors should be perfect for someone who likes their shave gel to come with the razor. 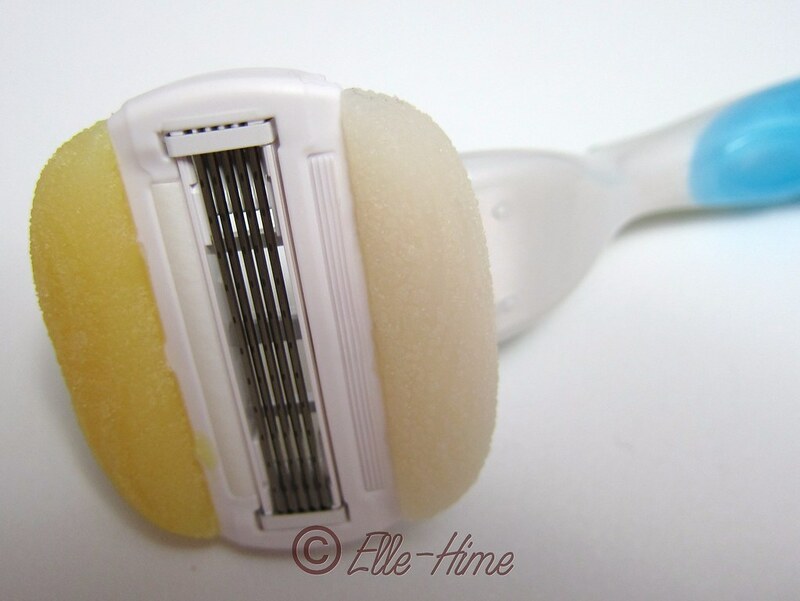 I also think that they would be good for beginners because the 5 blades are gentle to your skin. I'm loving the fact that everything can be swapped between handles and cartridges. I'd say that this is an eco-friendly move, and as someone who hates waste and would never go to disposables it's nice to know that I shouldn't ever be left with a handle that I can't get any blades on! Even though this hasn't become the perfect shaving product for me yet, I have high hopes that it will be. I'm really glad that I had the opportunity to try something different and hope that you found my review helpful. Thanks for reading! Thank you so much for doing this review (and for leaving it up)! I need a new razor and needed to compare the two, but was tired of the corporation 'marketing-speak'. I needed a real opinion. Keep 'em coming, please! You're very welcome and I'm so glad you found it helpful! 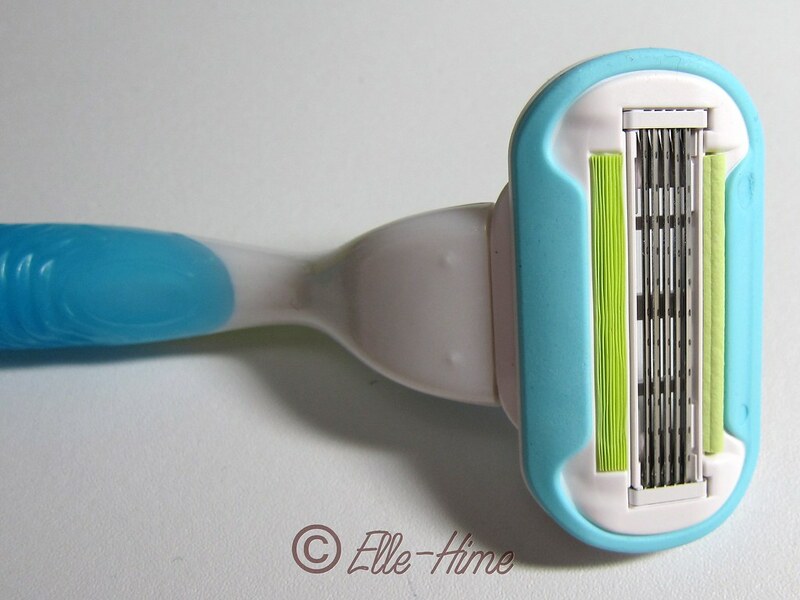 I'm still using this razor, those two blades ended up lasting me quite awhile (because I run razor cartridges into the ground, and because I tried a "not shaving" phase during my pregnancy, haha!). Now I've switched to the cheapest Venus blades and am going to put a review up for those in the future, too!